Sophomore Joey Calistri maneuvers the ball away from a Bradley defender Oct. 2 at Lakeside Field. Despite leading the Big Ten in goals and points per game, the forward hasn’t found the back of the net since that match. He had seven shots in Northwestern’s tie with Ohio State on Sunday. 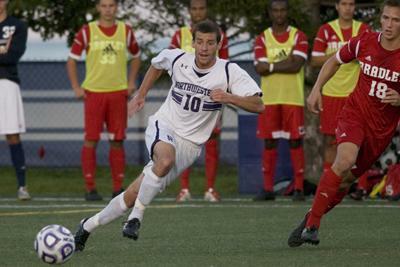 Northwestern fought to its fourth scoreless draw of the season Sunday afternoon in Columbus, Ohio. The No. 16 Wildcats (8-3-3, 1-1-1 Big Ten) couldn’t get on the board against Ohio State (2-6-5, 0-2-2) in what was the first match of a two-game conference road trip for NU. The game opened with a salvo of attacks from the Cats. Three different players took shots for NU in the first six minutes, but each attempt sailed over the net or was deflected wide. The offense kept its foot on the gas, producing another three chances before the midway point of the opening period. Sophomore midfielder Cole Missimo put a shot on goal in the 23rd minute, but Buckeyes goalkeeper Alex Ivanov made an impressive save to keep the game scoreless. Momentum shifted back to Ohio State for the remainder of the half, with the team generating many chances and landing two shots on goal. The Buckeyes looked to take advantage of sophomore goalie Zak Allen, who started for the Cats in place of junior Tyler Miller. The anchor of the defense was unable to play due to illness and will be out for a couple of weeks, coach Tim Lenahan said. Prior to this game, Miller had played every minute in goal for NU this season. Both squads dug in for the second half, and the match took on a more defensive rhythm. Offense returned as the period wore on, and sophomore forward Joey Calistri continued to power the Cats’ attack. NU’s leading scorer this season with 10 goals, Calistri took seven shots during the game. Looking to avoid a third straight overtime match, the Cats made a big push at the close of regulation. Senior midfielder Lepe Seetane had two shots on goal within the final five minutes, but neither volley found the back of the net. NU kept the pressure on Ivanov throughout both extra periods, forcing the Buckeyes’ goalkeeper to make three saves. However, Ohio State managed to hold on to a clean sheet. With their offenses generating few chances during overtime, both teams left the field with a 0-0 result. It was the third consecutive tie for the Cats and the second consecutive for the Buckeyes. The match was also the fifth tie game this fall for Ohio State. NU plays its next match Oct. 27, on the road against Penn State.